Editor's Note: Mike Lewis contributed to this post. You know the drill: Kids come in from recess, and before any learning can happen there are disputes to arbitrate and excited energy to calm down. But the day Tanner turned up early from recess in tears, he set in motion a chain of events that ultimately changed our classroom. A member of a competitive soccer team, Tanner's intense play wasn’t appreciated by his classmates, who responded by calling him names. After listening to Tanner’s emotional explanation of what happened, we realized there was a simple lack of understanding: Tanner’s school friends had one perception of him, and he didn’t see himself in the same way. The problem didn’t start and stop with Tanner, though—this judgmental, clique-like behavior was a pattern we, fourth- and fifth-grade co-teachers, noticed throughout our classroom and the school. While traditional methods of teaching made us want to solve this problem for Tanner, we knew that if we equipped our students with the right strategies, they could solve it on their own. But was Tanner’s side of the story compelling enough to change his classmates’ minds? And if all of our students had a chance to tell their own stories, could we go beyond changing students’ minds to changing their mindsets? Find all the links you'll need to do this project in your classroom. The resulting, three-month project—we think it could be reduced to two—took its inspiration from Danger of a Single Story, a TED talk given by novelist Chimamanda Ngozi Adichie, in which she calls on each of us to go beyond the incomplete stories offered by stereotypes and generalizations. 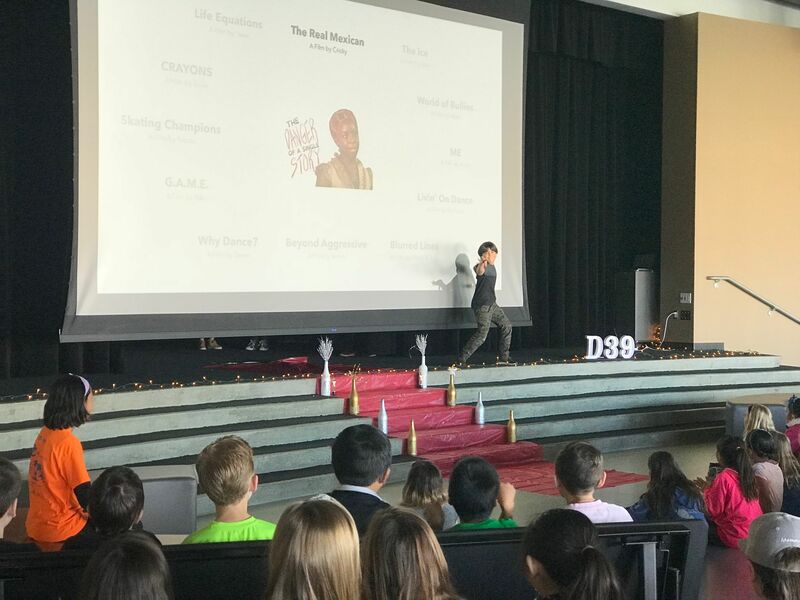 Inspired by her message, each of our students embarked on their own journeys of self-discovery by creating short documentary films about their most authentic selves. Through the experience, our students became multimedia storytellers, honing their skills in critical thinking, writing, and communication, which are critically needed for future success in a world where we tell and hear stories over multiple channels. They grew in persistence, often overcoming a myriad of obstacles and pushing through to the end. And they developed critical social and emotional skills of empathy, self-awareness, and teamwork, which fundamentally changed our classroom dynamics. To get students started, we began with the end. We gathered all 60 students together to show and discuss Adichie’s TED talk and the documentaries Growing Up Hip Hop, A(mexi)can, and Below the Surface, which were created by local high school students. As a class, we dissected these films, analyzing the filmmakers’ message, purpose, and target audience. We also read poetry and short stories and discussed how authors might share their inner thoughts through storytelling. This stage of our project provided a valuable opportunity for students to practice their writing skills. Reflecting on what they watched and read, students created their own short, ungraded pieces about a time they felt misunderstood or didn’t fit in. Self-discovery tools, such as a list of character traits and the Thrively Strengths Assessment, helped students develop the self-awareness and vocabulary they needed. We looked for sparks across their reflections and encouraged those as central ideas for their films. But as approachable as Stage One was designed to be, tension and frustration simmered throughout the class—so be prepared for it if you try this. We shouldn’t have been surprised: We tasked 9- and 10-year-olds with thinking about how they wanted to seen by others and how their actions influence how they are perceived. For many kids, it was the first time they ever thought about their value systems, let alone connecting their internal sense of self to their external actions. As we moved into Stage 2 of the project, our teaching focus shifted from self-discovery and story development to film production. Most students had solid ideas for their films by now. Many wanted to document their sports activities or show their passion for the arts. A few hoped to share their culture. To prepare to film, we watched more sample films as a class, but this time, with an eye for shot angles, B-roll, and scene setting. We listened to and analyzed interview answers and hypothesized what questions might have led to the best sound bytes. Students generated lists of who they needed to interview, along with possible questions for their sources. Co-teachers don’t always agree, and at this point Mindy was dying to have some structure. She felt strongly that we needed to create storyboards and scripts, while Billy encouraged giving students time to play with the camera to see what transpired. In the end, we decided to give students time to “play for purpose,” which proved valuable, especially for students who struggled with linear processes. As students gathered shots and interview footage with their phones, their stories bloomed. They found insights about themselves that never would have come out if we had stuck to a script—and those insights then gave them a purpose for scripting. When Cricky, one of our more boisterous students, took a trip to the border to interview his Mexican relatives and capture B-roll footage, his story took an important turn. This trip allowed him to engage with the Mexican-American community beyond his immediate family, and afterward his film became a political statement and a call for understanding. Now, a month or so into the project, students had loads of footage and were beginning to piece it together into films in iMovie. This is when we realized we had a problem: Students were simply patching all of the footage together with no narrative arc or storyline. To help students organize their stories, we once again looked at model films, discussing structures like problem and solution, compare and contrast, and a hero’s journey as possibilities for their own. But our most powerful support came through our own project—a short film we made about the process our class was going through. 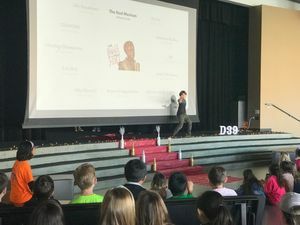 Step by step, we shared our filming and editing decision-making process through daily mini-lessons that helped students notice how B-roll was layered over interviews, how long before a shot became boring, and how to cut and connect footage. A teacher-created documentary chronicles the project. Another layer of writing came in at the end of this stage when students began to record their narration. Many wrote their script out and then recorded their voice. For reluctant writers, however, going straight to recording helped them get out their ideas out without having to write them down first. It also encouraged students—even our “fast finishers”—to revise as they listened to their narration over and over. While the process could feel disorganized—with every student at a different place—we realized students were actually learning to problem solve on their own. Students who had previously been unengaged or didn’t feel “smart” were suddenly stepping up as experts, and students became inclined to go to a peer for help rather than one of us. We knew we couldn’t fit all 60 films into a one night screening, so we spread our mini film festival screenings across two weeks and issued an open invite to other classes and our students’ families to attend. As festival deadlines approached, the scrambling over last-minute edits grew more frenzied as students raced the clock to finish their films for the big screen. When the dates arrived, we rolled out the red carpet—a red plastic tablecloth, to be exact—to showcase our students’ hard work. Some sessions had over 300 people in the audience and some only about 30, depending on the day and time. Our students rallied around one another and offered reassurance to anyone whose nerves kicked in. We launched the festival by sharing our own teacher documentary to guide the audience into our process and experiences. And, of course, we wanted parents to recognize the significant academic learning that took place, as we knew some were skeptical. After students’ films were shown, each student thoughtfully answered questions from the audience. Surprisingly, reflection moved from being a task they dreaded to something they enjoyed because it amplified their message. As our three-month journey wrapped up, our students finally saw themselves and each other, realizing their own superpowers often hidden underneath the costumes we wear each day. While we still have arguments, they now seek out and play with peers that they wouldn’t normally have talked to in the past. We know we achieved what we really wanted for this project, which was for each child to feel valued and for them to value each other. As teachers, we walked away realizing video is not a reward, it’s an entry point for today’s students to communicate their ideas and tell their stories. Video is not replacing literacy, it’s just the medium of this generation.